Modway, Imperial Collection, Dimensions: 33"W x 40.5"D x 32.5"H. Weight: 268 lbs. Set Includes: One - Zoe Leather Chair. One - Zoe Leather Sofa Mid-century modern style.Leather arm chair. 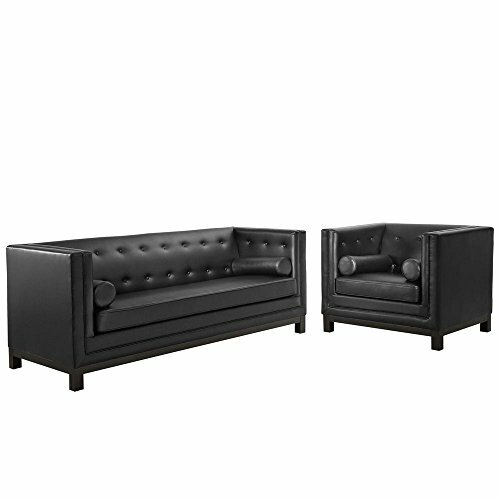 Solid wood frame.Wipe clean surface.Tufted buttons. Journey toward majesty with the Imperial mid-century modern style leather Living Room Set. Imbued with classic elegance, Imperial comes fully-featured with tufted buttons, side pillows, and luxurious fine stitch upholstery. A solid stained wood frame complements this piece of simple refinement and carefully poised grandeur.